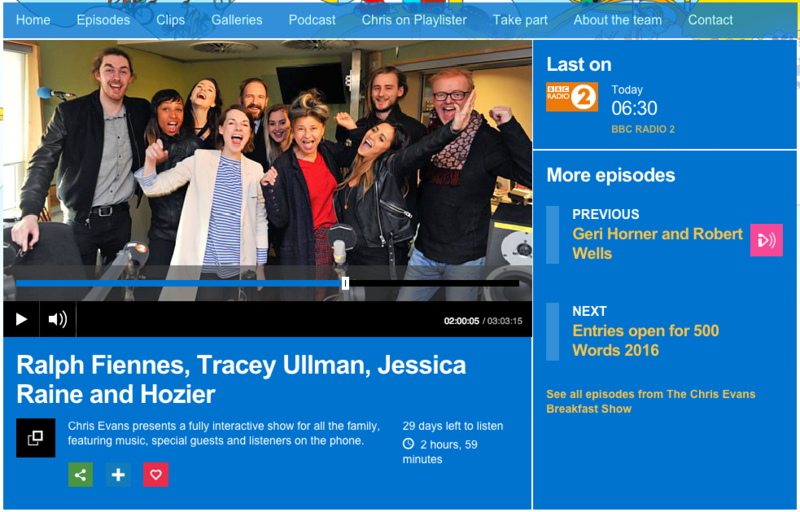 This morning Hozier stopped in to The Chris Evans Breakfast Show on BBC Radio 2 to play four songs and have a chat with Chris and his other guests: Ralph Fiennes, Tracey Ullman and Jessica Raine. The show is available on BBC iPlayer for the next 29 days. Listen from the 2:00:00 mark to hear: Take Me To Church, Someone New, Work Song and Whole Lotta Love. Tagged acoustic, BBC2, Chris Evans, Jessica Raine, Ralph Fiennes, Someone New, Take Me To Church, Tracey Ullman, Whole Lotta Love, Work Song. Bookmark the permalink.